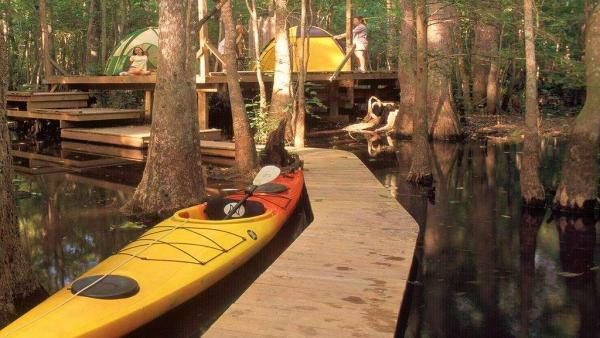 Commune with nature as you paddle the Roanoke River and spend the night in a riverside campsite in Halifax or Tillery, NC. NC’s Roanoke River and its tributaries offer a unique wilderness experience for paddlers and outdoor enthusiasts. Meandering from the Coastal plain to the Atlantic Ocean, the Roanoke River fans out through the largest intact bottomland hardwood forest ecosystem east of the Mississippi. This vast natural corridor is home to black bear, river otter, white-tail deer, bobcat, and beaver, plus more than 200 bird species. The Roanoke River is renowned for its abundant wildlife. Ancient bald cypress trees and towering tupelos form a lush overhead canopy along the Roanoke. Explore the historic streets of Halifax. The latest addition to the Roanoke River Paddle Trail is located on the river just outside this scenic town whose rich history includes chapters from the American Revolution and the Civil War. Then learn the story of an authentic New Deal resettlement community. One of the Roanoke River Paddle Trail’s newest camping options is located just outside Tillery, where descendants of the resettlement farmers have opened a fascinating museum called the History House.